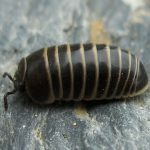 Pillbugs have many names – roly polies, armadillo bug, potato bug, or wood louse. Pillbugs are active at night when they eat decaying vegetable debris. They are known for their ability to roll into a ball. When there are a great number of pillbugs outside a foundation, they may find their way inside where they will die quickly from dehydration. However, they will survive in moisture rich environments in basements, cellars and crawl spaces. Pillbugs enter homes under doors and around ground-level windows. They won’t reproduce in houses or basements because it’s too dry and there is no food there for them and they will die. If there is a significant presence of pillbugs it usually means a high moisture area possibly caused by a water leak. Pillbugs ten to live under items on damp ground. Check the moisture levels in the basement, garage, cellars and crawl spaces. Also reducing moisture collecting materials outside the home will help decrease their natural habitat areas.